Wodney Wat is a shy rat who cannot pronounce his r’s, a serious affliction for a rodent. His classmates in an elementary school attended apparently by only rats but taught by a guinea pig, make fun of him so Wodney (actually Rodney in case you didn’t get it), almost never speaks. One day a new rodent joins the class, Camilla Capybara, who is large and smart but also aggressive and careless toward the lesser rodents. Wodney and his classmates are all scared and jealous of Camilla, and like most youngsters, they dislike her because of her differences. When the young rats and Camilla go outside for recess, Wodney is inexplicably chosen (you’ll remember his classmates don’t like him either) to lead the game of Simon Says. Wodney mispronounces everything, for example saying “Wake the leaves” instead of “Rake the leaves.” The other kids all understand him because they know about Wodney’s problem but poor Camilla Capybara takes him literally. When Wodney tells everyone to “go west,” Camilla heads off in the sunset never to be seen again. This makes Wodney the class hero. I think the message of this book is that some differences should be tolerated (Rodney’s speech impediment) while others should not (Camilla’s size and the fact that she is a different species). I don’t think this is the book’s intent but it can certainly be read that way and a fair percentage of readers are bound to see it, even if only subconsciously. Another thing I disliked about this book was that it doesn’t show Rodney striving to overcome his speech problem. My son had this exact problem when he was the age of the average reader of this book and through hard work and speech therapy, he learned to pronounce his r’s correctly. Obviously not all disabilities are treatable, for instance my husband is a paraplegic and we find it really annoying when people say you can overcome that type of injury by trying harder. But this is one disability that can be corrected if treated early enough and that message is totally missing from this book. I got so excited when my owner said we were going to read a picture book about a capybara! I love pictures and I love capybaras, what could be better (besides yogurt)? But why did the rats pick on that poor little capybara? She was at a new school, just trying to make friends. It’s always hard when you don’t know anyone and everyone else is friends with everyone else and they won’t even talk to you. Especially if you’re a little different like Camilla was in this story. Maybe she just knocked those kdis over because we capybaras have our eyes on the sides of our heads so be don’t have binocular vision. 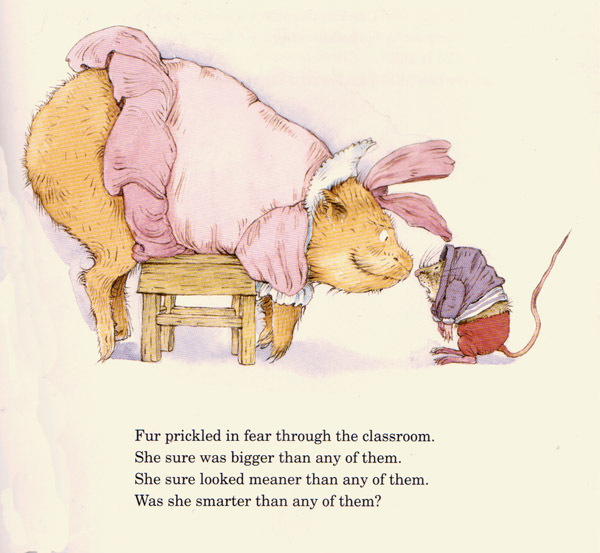 And the illustrator drew Camilla as big and ugly and the rats as cute and small. I can’t help how big we are. And anyway, plenty of people think I’m cute. Do you really have to be small to be cute? At the end of the book I had to wipe the tears out of my eyes as my poor cousin walks off and is never seen again while all the little rats celebrate. I hope Camilla found her way home and I don’t blame her for never going back to that school.